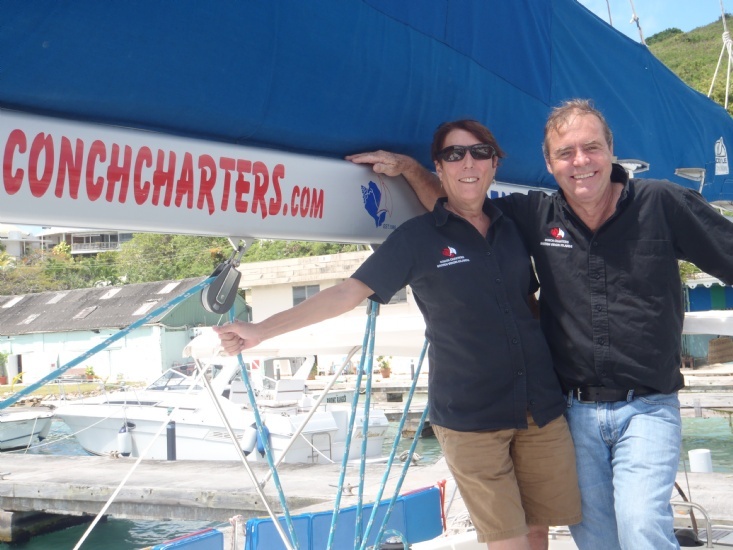 The family-run BVI charter company is celebrating their silver anniversary. Does starting a charter company from scratch sound like fun? Twenty-five years ago, my wife, Cindy, and I took a path less travelled, and started a charter company in the British Virgin Islands. Motivated by Caribbean sunshine and Canadian winters, the choice was a no brainer. The business started with us buying two yachts, as it was difficult to convince someone to join our fleet if we didn’t have one. This was, of course, after selling everything we owned, like our house, boat and then handing back the keys to the company car. Advertising in those days was a small classified ad taken out in Cruising World. Cindy has always handled the public relations side of the business, but I had to keep telling her that P.R. does not stand for Pub Running. We remember our first customer, a fireman from New Jersey called Jack Connelly. He mumbled that we sent him out on a yacht called Nishikazi on Pearl Harbor Day. December 7th, 1987 is etched in our memory forever, when it all began. One scary highlight along the way was Hurricane Hugo in September of 1989. It was the biggest and meanest hurricane we’ve ever had in the BVI. In those days there was no Weather Channel to tell you exactly where it was, where it was heading, and how strong it was. Basically, it was a Category 5, the deadliest. When we closed the door the night before Hugo’s arrival, we had no idea if our dream was over and we would be heading back to Canada. In the morning, there wasn’t a leaf left on a tree and debris was everywhere, but aside from a few bumps and bruises, the fleet of five had weathered the storm and the dream continued. We made it without an insurance claim. “You should see my office here, between the shelves of sheets and towels!” Wendy replied. Peter Twist joined the Conch team as a partner 15 years ago. He brings an engineering background, always improving the technical side of the business. The rest of the team is the best, and we would not be where we are today without them. Presently we’re operating around 47 yachts, cats and monohulls. We’ve always tried to keep the feel of a family-run business, which our customers seem to like. To all our customers, boat owners, staff and business associates, we would like to say thanks for the past 25 years. Yes, it has been fun! The proof is in the slogan on our T-shirts: “If you chartered with anyone else, you missed the Conch-cept!